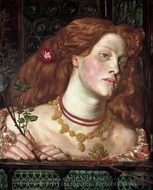 The English painter and poet Dante Gabriel Rossetti was a co-founder of the Pre-Raphaelite Brotherhood, a band of painters that reacted against unimaginative and traditional historical paintings. 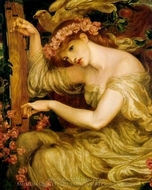 His works show a passionate imagination, strongly contrasting Victorian art which was popular during the second half of the nineteenth century. 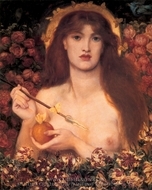 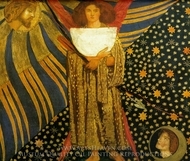 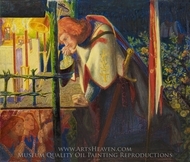 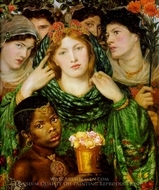 Rossetti did not have the natural technical talent that is seen in the small detail and brilliant color of a typical Pre-Raphaelite painting, and his early oil paintings, the Girlhood of Mary Virgin and the Ecce Ancilla Domini, were produced only at the expense of great technical effort. 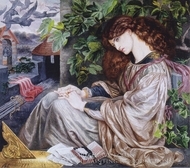 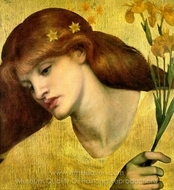 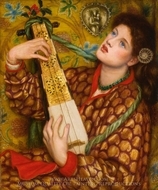 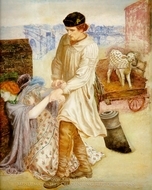 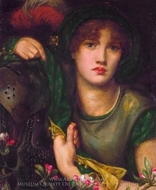 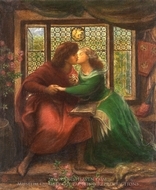 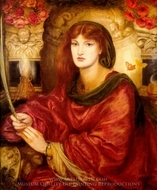 In the less demanding technique of watercolor, however, Rossetti clearly revealed his imaginative power. 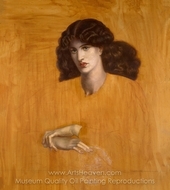 In almost all of Rossetti's painting of the 1850s he used Elizabeth Siddal as his model. 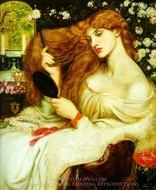 Discovered in a hat shop in 1850, she was adopted by the Brotherhood as their ideal of feminine beauty. 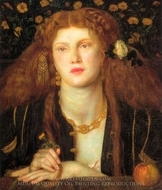 In 1852 she became exclusively Rossetti's model, and in 1860 his wife. 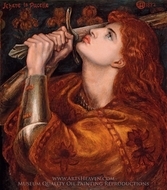 Struggling with growing depression, she killed herself two years later. 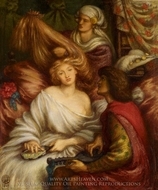 Rossetti buried a manuscript of his poems in her coffin, a characteristically dramatic gesture which he later regretted. 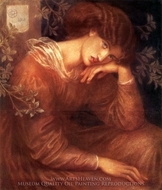 Beata Beatrix, a posthumous portrait (portrait done after her death) of Elizabeth Siddal is one of Rossetti's most deeply felt paintings. 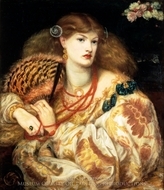 It is one of his last masterpieces and the first in a series of symbolic, female portraits, which declined gradually in quality as his interest in painting decreased.